ow that cell phones became so smart, it was about time for the other common gadgets in our life to receive the same prefix. The next, waiting in line are watches. Not only do they get smart but also get to complement smartphones’ work. But let’s take a look at the device I am trying to picture for you. 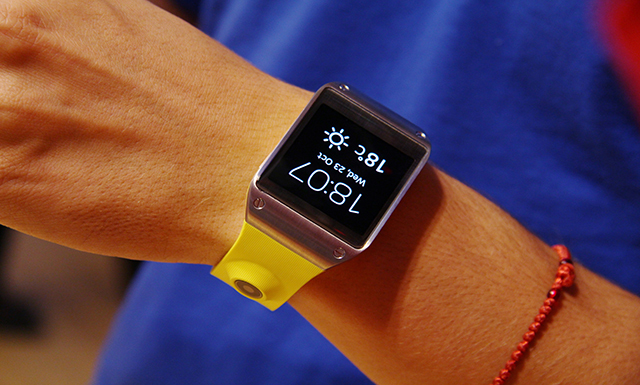 This is Samsung Galaxy Gear Watch. Gear is one of the first wearable smart gadgets to appear on the market. The device instantly draws the attention with the vibrant color on its rubber strap and big 1.63 inch display. It is a well-built but rather bulky watch. Personally I can’t see myself using it on my tiny wrist. The front is made of aluminum and that brushed metal face can be combined with black, beige, grey or orange, green and yellow strap colors. Other than that the Super AMOLED display looks really great – the resolution is 320×320 pixels. Details are razor-sharp thanks to the high pixel density of 278 ppi. 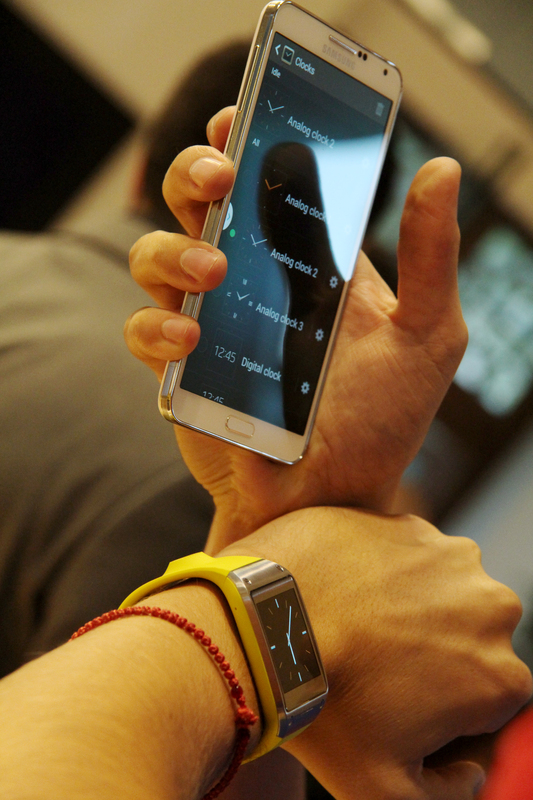 The touch-enabled screen allows you to navigate through menus, answer calls and view photos. The blacks are deep and clear – checking the time is a pleasure to the eye. 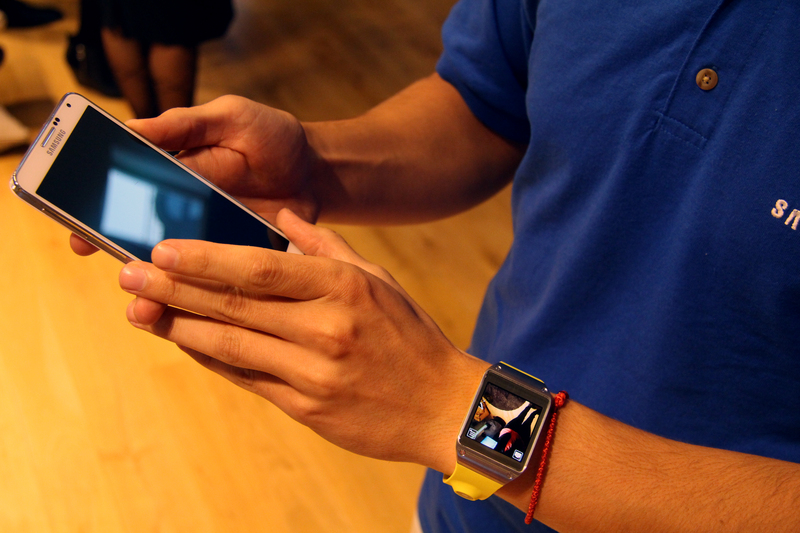 There is only one single button on the Galaxy Gear – the power key, which is also used to launch the S-Voice application with a double press. The device is powered by a 800MHz CPU which is just enough to get you through all it is capable of fast and easy. The system memory is 512MB. On the back there are a few metal pins. This is where a special external charging case is attached. The device has a 315mAh Li-Ion battery piece onboard. It provides a pretty decent battery life agetting you through a whole day of heavy usage. The whole purpose of this gadget is to give you quick access to your smarphone functions without you bothering to take the handset out of your pocket. It uses Bluetooth connection to link with the smartphone and receive calls and text messages directly on the watch. Of course if you don’t mind other people listening to your conversation you can go ahead and talk directly from the watch, but always on loudspeaker. The lack of a headphone jack is a pretty bad surprise here – no privacy of the calls whatsoever. In noisy environments we experienced some trouble hearing the other person as the speaker is not loud enough. Call quality is pretty good as there are 2 microphones to reduce background noise. To initiate a call you can access your phone contacts and double tap on the person you wish to call, or to be even more simple, you can just use S Voice. The home screen displays the time and also updates regularly to display the current weather conditions and temperature. To customize it with what looks best for you, there is a whole bunch of analogue and digital clock styles to choose between. 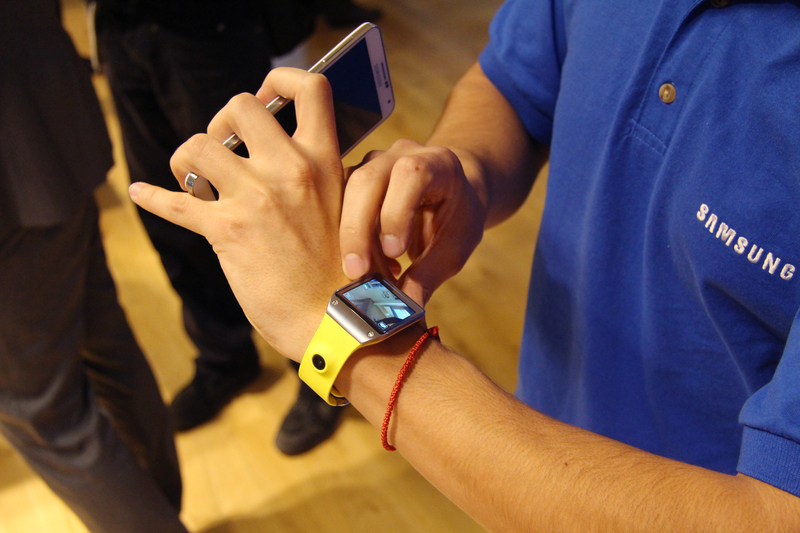 There is a 1.9MP camera build into the strap of the watch. It looks and feels kind of weird at first but it is actually very comfortable for taking pictures or spying on someone. The camera has an auto-focus and a built in BSI sensor for better low-light performance as a flash here is missing. Gear’s interface is simple and clean. A swipe on the screen browses through a few basic menus and application list. Unfortunately web access is still not supported by this device – it is not possible to use it even for basic tasks like checking your email or Facebook. But it is something that is going to happen in the future, Samsung says. Galaxy Gear was introduced with the latest Galaxy Note 3 and so far it is compatible only with this device and the Galaxy 10.1, which ridiculously limiting. Hopefully it will be updated to work with Galaxy S3, S4 and Note 2 by the end of this year, Samsung says. And still it targets a very very small market segment.